174. 10 Commandments to Making an Award-Winning Viral Music Video – How to Shape Human Behavior. No magic. Similar to the laws of product and website UI/UX interface design, everything in your video must be intuitive; easily understood by a typical viewer. Band integration. Contrary to modern use of technology, the machine interacts with and upon the band members, not the band members interacting upon the machine. Emotional consistency. 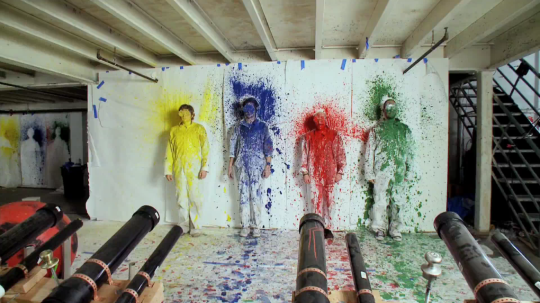 As the mood in the music video changes, so to must the band’s interaction with the Rube Goldberg machine. Use all available space. The Rube Goldberg machine filled a 10,000 square foot, 2-story warehouse plus exterior loading dock in Los Angeles. Machine provokes the interaction. At 0:23 seconds a lever falls and pushes the play button on an iPod, thus beginning the music video. Music and machine beats synchronised. At the end of the music video the music fades and the machine itself plays part of the song. Months of filming and 85 takes to get that one, perfect video, of which only 3 takes successfully made it to the end of the video. When orchestrating millions of tiny pieces that must all work together for the success of a final project, it is the small, seemingly insignificant stuff that causes the most problems. Project planning is imperative, and ideation, prototyping, troubleshooting, and testing is the best way to limit mistakes. But regardless the amount of planning and preparation, nothing is ever 100% foolproof. Put your must consistently reliable steps at the end of the project, that way if things go wrong they can be corrected at the beginning without wastng too much time and money. Be prepared for disagreement and opposition. Posted on February 28, 2016 May 18, 2016 by Joshua SMITHPosted in interviewTagged adam sadowsky, music, ok go, startups, ted talks, viral marketing.